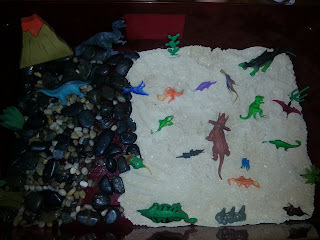 This is our dinosaur play land that we set up yesterday. One side is covered with rocks and the other side is covered with our Moon Sand Dough. There are a bunch of different dinosaurs along with some different scenery items. I am in the process of making an erupting mini volcano to add to it. I decided to make this to go along with our dinosaur sensory tub and other dinosaur activities that we have been working on. I'm glad I did because my little dinosaur is loving it! 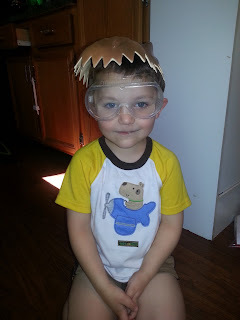 Here is my youngest all ready for some dinosaur play with his T-Rex hat that we got at that Dollar Tree and his safety goggles on! Ha! A little Paleontologist in the making! Gosh I would've loved this when I was a little girl! I was always driving everyone crazy with dinosaur facts and insisted on sleeping with hard rubber dinosaurs in my bed lol. My little girl seems to like dinosaurs too, but she is not yet two so it's kind of early yet to really tell. She will definitely enjoy doing this, though, and her big obsession is the moon and astronauts, so as soon as I say, "Moon sand," her little eyes will just light up! Peanut Butter Cup S'mores Anyone?? Make Your Own Silly Putty! Swamp Play WITHOUT the Swamp!! Make Your Own Moon Sand with Just 3 Ingredients! Fun with Color Changing Magic Potion!! Almonds Are Delicious and Great for Your Health! Moon Dough-- Make Your Own in Minutes!! Ant Free Sand Box-- Find Out How!! Hot Day? Beat the Heat with Freeze Dough! !